Best Boxers Dog Food: Raw Feed or Commercial Kibble? » Best Boxers Dog Food: Raw Feed or Commercial Kibble? Originally bred as guard dogs, Boxers are a medium breed that also makes a great family dog. Boxers love kids and being around their people, plus they generally get along well with strangers and other dogs. This breed is high energy, so they do best living an active lifestyle with lots of play and exercise. Getting your Boxer’s nutrition right is imperative, because like most pure breed dogs Boxers are susceptible to certain health problems like hip dysplasia, allergies, and bloat. Since this breed gains weight easily, owners need to watch their diet and exercise to make sure that their boxer doesn’t become overweight. This is the best commercial dry dog food to feed a Boxer Dog, because it's very high in healthy proteins, grain-free which is great for their sensitive digestive systems and low in fats and calories, plus it’s 100% Made in the USA. Given this information you might be wondering what diet is best for your Boxer - raw or commercial. Whatever method you choose, as an owner it’s your responsibility to research the feeding method that works for you and your dog and make sure they are getting the best nutrition possible. Raw feeding has become a popular alternative to commercial dog food because owners believe that it more closely resembles dogs’ natural diet. Another benefit to raw feeding is that owners know exactly what they’re feeding their dogs, without having to worry about cheap fillers, preservatives, and artificial ingredients taking a toll on their dog’s health. One raw diet that many owners stand by is BARF, which stands for Biologically Appropriate Raw Food. This diet consists of meals made with meat, offal, bones, vegetables, fruits, eggs, and other ingredients like flaxseed and kelp. BARF food can be prepared at home or purchased in pet supply stores. To be safe, it’s generally recommended that owners feed their dogs a high quality commercial dry dog food, since these foods are scientifically formulated to meet dogs’ nutritional requirements and don’t carry the same risk of contamination that comes with raw diets. Commercial dog food is generally more affordable, convenient, and less time consuming than making your dog’s food at home. Of course, commercial dog food is not all good. Owners should do their best to avoid bargain brands or grocery store brands and instead purchase their dog’s food at pet supply stores or by a vet’s recommendation. It’s important to look at the list of ingredients and make sure that the top five include named meat sources and other quality ingredients. Compared to other breeds, Boxers don’t always do well with commercial diets, so owners should choose their dogs’ food carefully. Preservative-free and grain-free is best for Boxers’ sensitive digestive systems. Pork, poultry, oats, and rye are recommended ingredients because they were part of Boxer’s natural diet, whereas ingredients like fish, horse meat, soy, beat pulp, and rice should be avoided. One way to make sure your dog’s food meets important nutritional requirements is looking for an AAFCO statement. By finding a quality kibble formulated for all life stages, you can keep your Boxer on one food and avoid triggering digestive issues caused by switching foods. Adult Boxers require approximately 1,100 to 2,400 calories a day depending on their size and activity levels. Boxers should be on a diet that’s high in protein, ideally around 30%. How much food do you feed a Boxer dog? Boxers should generally be fed between one and three cups of food per day, split into two meals. Make sure that you measure your dog’s food per their weight and adjust based on energy levels. What type of dog food is best for Boxers? Because Boxers have sensitive digestive systems, a carefully followed raw diet taken on with the advice of a vet can be a good option. If you choose to go with a commercial diet, pay close attention to the ingredients. Since bloat is a danger with this breed, a grain-free kibble is best and using a slow-feeder will go a long way to avoid dog-bloat. What is the best brand of dog food for Boxers? It is possible to feed your dog a diet a mix of dry and raw food, but these should be given to the dog separately to avoid digestive issues. Since Boxers have sensitive digestive systems to begin with, one diet is usually best. Any changes should be discussed with a vet first to make sure that their nutrition isn’t thrown off. Out of the brands considered best for Boxers, Merrick Grain Free Dry Dog Food is the one that stands out as the best. This dog food is not only AAFCO certified for All Life Stages but is also SQF Institute Certified. This recipe is grain-free which is best for Boxers’ sensitive digestive systems and contains 38% protein and 15% crude-fat which is great for this high energy breed, with 385 kcal/cup. Another reason that this is a great kibble for Boxers are the ingredients. Merrick is cooked in the USA in organically certified kitchens and never uses ingredients from China. The first five ingredients in the Texas Beef and Sweet Potato Recipe are deboned beef, lamb meal, sweet potatoes, peas, and potatoes. The first two ingredients are high in protein and the last three are digestible carbohydrates for energy. 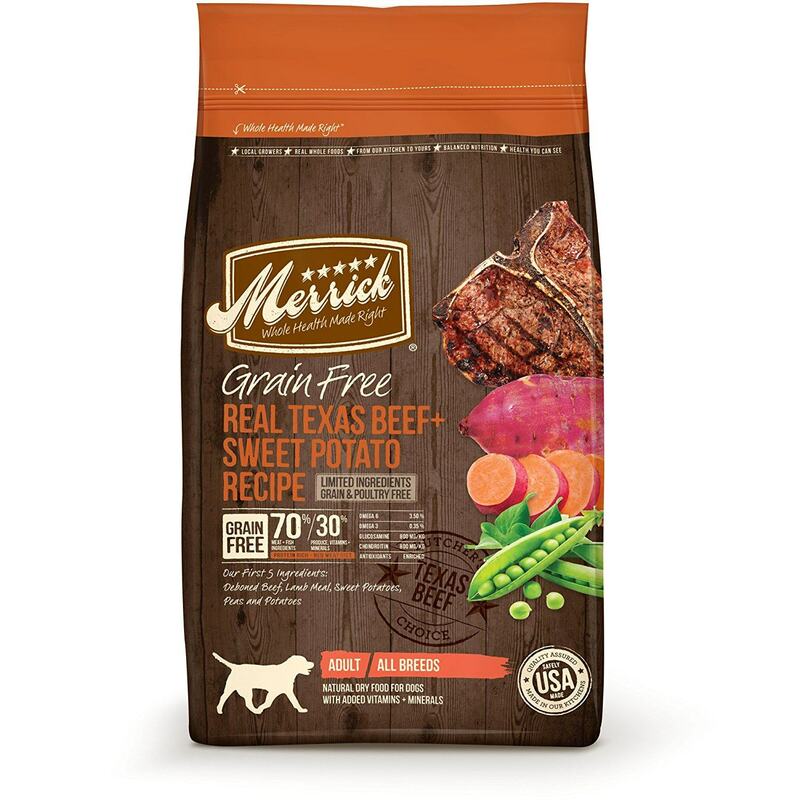 Merrick comes highly rated by dog owners and their dry dog food has not had any recalls. The company, named after Garth Merrick, has prided itself on providing dogs with hand-crafted, all-natural pet food since 1988. Owners can follow the detailed feeding guide on the packaging to work out how much and how often they should feed their Boxer dog based on weight and adjust for age and activity levels. It is free corn, wheat, soy and is both gluten and grain-free. Overall this could be the perfect choice for your Boxer growing puppy, active adult or senior Boxer since it is an all life stage formula. Merrick also has other grain free formulas as well as limited ingredient diets, raw-infused foods, foods with grains, and canned dog foods. Compared to some dog breeds, Boxer owners may need to do some extra research to find a diet that works for their dog. Boxers are high-energy dogs, so they need a food with more protein than most, and they have a lot of food sensitivities that need to be looked out for. A carefully formulated raw diet or grain-free commercial kibble like Merrick Grain Free are best for this breed.